Weed control in Ontario isn’t as easy as it once was. But it doesn’t mean that a healthy lawn isn’t out of the question. It just means that it takes a different perspective and a little teamwork. 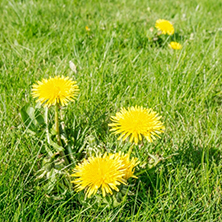 A healthy, green lawn has many environmental benefits but since the government banned the use of traditional weed control in Ontario, it has become more difficult to control weeds. However, if you follow the correct cutting, watering, seeding, aerating and weed control instructions you can still have a healthy, green lawn that is resistant to weeds in Ontario. In the following post, we will discuss what you can reasonably expect to see for weed control services in Ontario. Prior to the new legislation, the weed control would take an average of 3-5 days for the weeds to be controlled; however, with Fiesta, the natural alternative, it does take an average of 10-14 days. You should see a fairly immediate reaction after each weed control visit (weeds will start to blacken around the edges); however, not all weeds absorb the product at the same time. By allowing the full-time frame for the treatment to work, you will maximize the effectiveness of the application. More treatments are not always the most effective approach. With any weed control, it is important to consider the amount of product that is being applied. It is also important to allow for the time it takes for the weeds to achieve the appropriate response. Here at Dr. Green, we adhere to IPM (Integrated Pest Management) guidelines. This means that we are trained to identify and determine the most accurate amount of product and application time to effectively control the issue. Because of this, we will be able to use the exact amount of product to achieve more long term results and not run the risk of over-applying. Furthermore, this application method helps our environment by ensuring we aren’t putting down more than we need to. While the natural products approved for use in the Province of Ontario manages the existing weeds, it is not a weed preventative. The product needs to be absorbed into the leaves of an existing weed and then travel down to the root system to suppress that weed from re-growth. Because of this, it is critical to keep your lawn cut during the season to maximize the effectiveness of each weed control application. The best preventative measure you can take for your lawn is regular seeding. Weeds love space. So if your lawn is thin or has bare areas it becomes a perfect breeding ground for weeds to multiply. It is important to seed bare areas both in the spring and the fall to help thicken them up. This will cause less space for the weeds to thrive and you will be able to manage them more efficiently. Set your mower blade to cut at 2 ½ -3” and cut regularly. This will help build strong roots that naturally suppress weeds! While we understand that weeds are a concern to our customers (and of course ourselves! ), it is important to have a little patience when it comes to the management of them. But with active teamwork and communication, you will see a significant reduction in the weeds on your lawn as the season continues. With regularly spaced treatments they’ll become much more manageable and your lawn will thank you! Check out our website for more helpful tips!